(CHRIS) We awoke at 9 or 10 to find ourselves in a nice, crowded campsite (yest. Was a S.A. holiday – today was Zim holiday – part of the problem yesterday) that had a rocky mountain next to it. The bathroom had pretty, multi-colored urinal mints. The showers were also A-1. I could not reach Lynda or Theresa Hebron on the phone, so we drove to Kruger. This national park continued the S.A. courtesies by taking Visa at the gate. We liked the roads and pretty scenery, but there were not a lot of animals to be seen because the brush was thick. However, occasionally, an elephant would emerge. Awesome. Giraffe. Cool. At one of the many nice camps, we got gas and called ahead to get a camp site further south – Shingwedzi. We also got some Polony Lunch Meat. It looked like an Asian aphrodisiac, yet Sam left the wrinkled end piece of the wiener on the dash to dry in the sun. We ate the sandwiches at a watering hole where a playful elephant and large water fowl roamed with the antelope. We saw the usual animals but no cats. Many waterholes were dried up. One time, we scared an elephant who was walking along ahead of us. He turned and fake-charged the car before turning off at his exit. Late in the day, just before reaching Shwing, we saw a cat jam and stopped for a peak. It took us a moment but then we saw her emerge from the reeds. 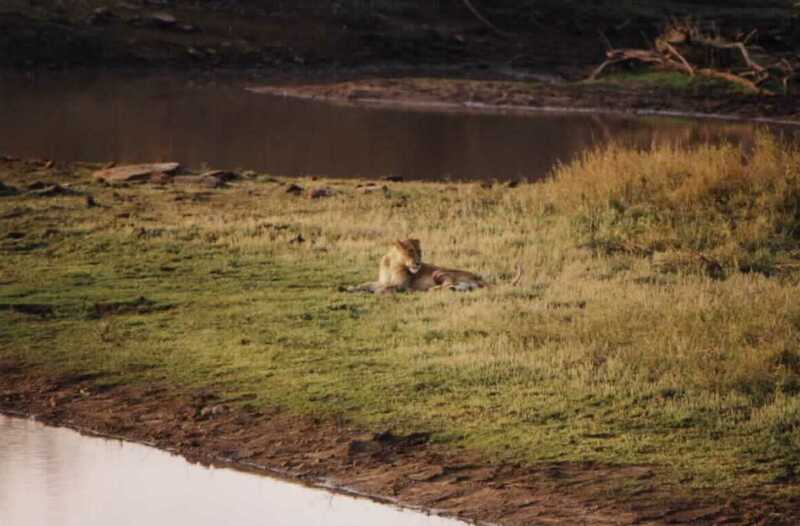 Lady lion sprawled out on the grass next to the water. She was injured. A chunk of fur on her back thigh was missing, exposing a bloody area about 4 x 6 inches. Must have found a zebra that bit back. Lovely nature – Honey, pass the badger brains! Shing was a bit crowded but we found a spot for the tent and some food, etc. they took Visa too! 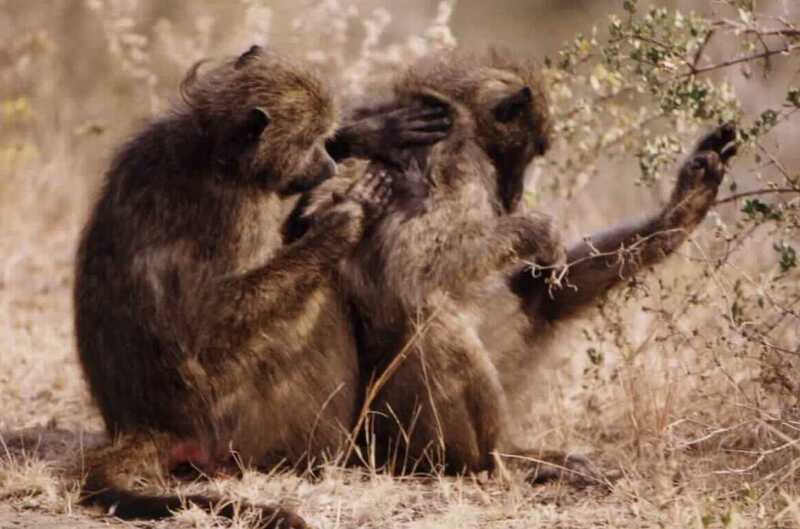 We were hoping they had lit pits like Etosha, but no such luck. We had a beer and Morp and made some phone calls – Paul got invited to the White House! He decided he would say the following to Slick, “Hey, Taylor – I’m from Ft. Wayne too!” It worked when he met Heston. GET YOUR FILTHY PAWS OFF ME, YOU DIRTY ANIMALS! It was a HYENA – up close – yes, we now noticed why so many pitched camp near the electric fence. When you ate, these laughers came right up to the fence to beg. Thus, we were just 2 feet away from these killers when we went to our neighbor’s camp site. They seemed actually to be a bit wimpy when reduced to begging. Still nice to have a fence inbetween. JUST don’t pee on the electric fence.